The FIFA World Cup took place during June and July of 2010. I'm a soccer fan so I was glued to my TV watching big games or watching Univision's live online feed of every game. I started thinking - does all this excitement for soccer get people to buy more soccer video games and does it affect the price of used soccer games? I analyzed the prices and number of units sold for 180 soccer games. This excludes games that were released within the last year because they would increase the average price during the month they released and would be comparing apples to oranges. 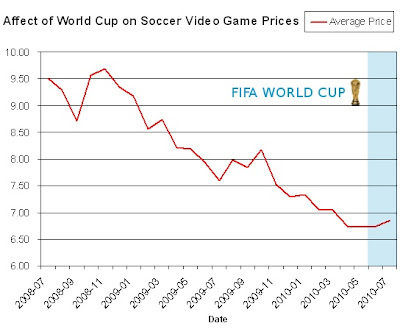 Like most sports games, the price of the average soccer game has been decreasing over time. There is a fairly regular price increase starting in August each year and ending in October or November. This is most likely caused by the start of the European soccer leagues every fall. The price during the World Cup (highlighted in blue above) was nothing out of the ordinary. The average price was $6.72 in May, $6.74 in June, and $6.85 in July. So over the course of the World Cup prices increased 2%, which is not statistically significant. Prices on used soccer games didn't change much, but the number of items sold definitely did. During the course of the World Cup, the average number of successful sales on ebay went from 80 on June 10th to 130 on July 11th (the date of the Final game). A 63% increase. 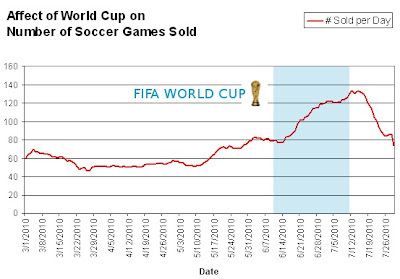 The number of games sold per day quickly dropped after the World Cup was finished so interest in soccer games didn't outlast the tournament. Why Did Prices Stay the Same While Units Sold Spiked? Obviously the demand for soccer video games increased a lot during the Soccer World Cup, but prices stayed almost exactly the same. So supply must have increased along with the demand. Lots of people probably decided to sell their old soccer games now while they could take advantage of the World Cup. Over the last couple weeks, the eBay completed auctions feature had become painfully slow. Often the data wouldn't load at all and many times it was taking 30 seconds or longer. Our goal is to make the site fast enough that you never have to wait for the data you're looking for. I adjusted some database settings today which appear to have sped up the closed auction feature substantially. In testing, we routinely got back the data we wanted in under a second. If you notice sluggish performance anywhere on the site, please let us know and we'll try to fix it. Back in February, we added a feature to the site letting you see completed eBay auctions for games listed on our site. That feature has become quite popular. Some visitors have reported that auctions occasionally appear in the list which are for the wrong game. For instance, some eBay sellers list EarthBound keychains as if they were EarthBound games. Our pricing bots don't know the seller is being deceptive, so those sales sometimes push the price of EarthBound downward. If you click OK, it notifies us of the problem and deletes that row from the list of completed auctions on your screen. Now you don't have to look at that incorrect auction. We'll investigate the auction and if we agree that it's incorrect, we'll permanently delete it from our database (or assign it to the correct product in our system). Hopefully this makes it easy for you to help us improve the quality of VGPC's prices. If you have any suggestions about this feature, or any other feature, please let us know. One of our readers contacted us to say that VideoGamePriceCharts helped them get back into game collecting and make some money while they did it. We decided to share his story with everyone so you can use some of the same tools for your collecting and maybe help make some extra money you can use to buy more games. First a little background on the collector. His name is Rob and he lives in Canada. He was born in 1982 and has been a collector since he received Atari 7800. Unfortunately he had to sell off his extensive collection of NES, SNES, Atari, N64, and PS1 games seven years ago for financial reasons. 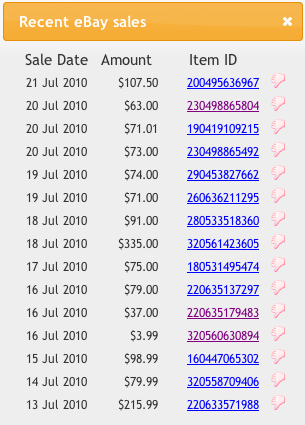 In March 2009, Rob started checking out Kijiji.com (now called Ebay Classified in the USA) for video games and other items. One day he found a listing in a nearby city that said it was for a "fairly big lot of games, systems, and accessories" and offered $300 for the items. The seller said that had "tons" of games and wanted more like $2,500 and included a partial list of some of the best items. Rob didn't know how much to offer for the items so he searched Google for "video game values" and found VGPC.com. 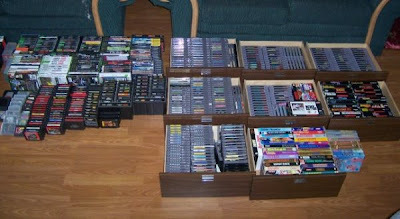 He scanned the PS1, NES, N64, and SNES price lists and saw that the games were worth at least $3,500 to $4,000! Rob then negotiated with the seller for a couple of weeks and settled on the price of $1,700 for all the video games. In one fell swoop Rob had a video game collection back. He keep many of the games for the collection but also sold ones he didn't want or could get a really good price for. Now he checks online sites like kijiji and craiglists daily, looks in the newspaper, goes to garage sales, and shops at a flea market every Sunday so he can add new games to his collection. He says "many items I buy to add to my collection, but many I purchase strictly because its a great buy and I know the resale value". Rob says the "money is just a bonus, but its fully a fun hobby I enjoy doing. I enjoy the search, I enjoy bargaining, talking games, etc.."
I think its a great hobby if it can partially fund itself by reselling some items and keeping others. TOTAL OF 96 CONSOLES !!! All consoles are complete with hookups and controllers. - 32 Gameboy and Gameboy Color games. TOTAL OF 703 GAMES !!! The one and only Nintendo Campus Challenge is back on the market after one year. Last summer I sold this game to a collector for $20,100. That same collector has it listed on ebay with a starting price of $88,888. The seller knows they won't get close to that much for it but wants to see some offers from interested parties. If your interested, submit an offer. Maybe the seller will accept and you'll own a one-of-a-kind video game collectors item. Or you can buy a reproduction for $75. 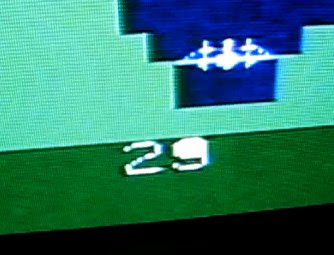 There is an Atlantis II for Atari 2600 auction on ebay. The game is already selling for $230 and is sure to go much higher. 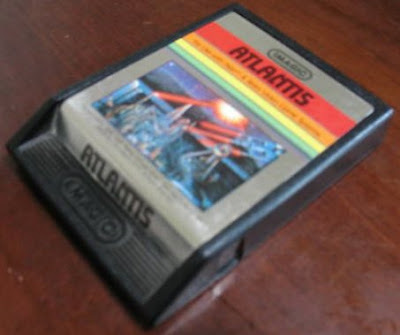 Atlantis II is one of the rarest games for the Atari 2600. Not quite as rare as Air Raid but some collectors think there are fewer than 25 of these ever made. The game was made by Imagic and is a sequel to the original Atlantis for 2600, but was made specifically for a contest to determine the top four players in the world. 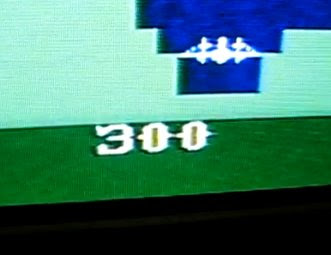 Gamers would send in their high scores from the original Atlantis and the top scores would be flown to Bermuda for the Great Defend Atlantis Shoot-Off on November 14, 1982. Lots of players sent in their scores and more than four even maxed out the score on Atlantis. Imagic couldn't determine a winner the way they originally planned so they made Atlantis II. Atlantis II harder, faster, and lower scoring so they could determine the winner. The top competitors were mailed the game along with some other prizes and told to mail in their scores after two days of playing. The exact number of games mailed has never been confirmed but estimates range from 250 to 25. 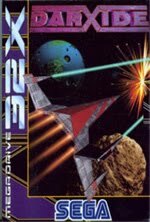 Thank you AtariAge for your information on Atlantis II . You can read a much more thorough history on their site. 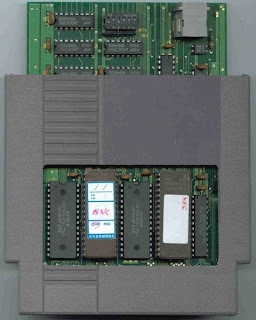 The Atlantis II and original Atlantis cartridges look the exact same on the outside so telling them apart isn't like normal games. It requires a scale or seeing actual game play footage. The other difference between Atlantis and Atlantis II is the font. The font on the score for Atlantis is a serif font (fancy lines on the edges of the letters) while Atlantis II was a sans-serif font (no fancy design). Who would have thought typography would come in handy in video game collecting? Atlantis II weights less than Atlantis I. According to this Youtube video Atlantis II should weight about 5.42 grams. Regular Atlantis weights 5.55 grams. Every Atari 2600 collector should go put their Atlantis cartridge on the scale and see if how much it weights. That one test might be worth hundreds of dollars. Don't have a digital scale? You can find one at most grocery stores. Try the produce section of the store and see if they have a digital scale. If not, then go through self-checkout and pretend you have bananas. It will ask for the weight, so put the cartridge on the scale and see what the scale shows for the weight. Take a photo of the weight so you have evidence you own the Atlantis II version. Three months ago, we implemented a feature letting you compare current listings across eBay, Amazon and Half from a single page. For those looking to buy a game right now, it helps you find the best price without wading through individual listings spread across three separate sites. As we've been eating our own dog food, we found a couple rough edges that we've now polished up. We originally showed the 10 lowest-priced listings for each condition. That turned out to be too many. Beyond the 4th or 5th, most listings were overpriced. Now we only show the top 5 listings for each condition. This also lets you see more conditions in your browser window without scrolling. Many eBay sellers start their listings at $1 and each auction lasts for a few days. During the early days of the auction, the price is substantially lower than the final closing price will be. Comparing auctions with 24 hours remaining to those with 2 hours remaining artificially favors the longer-duration auction. That's not helpful, so we've adjusted the comparison algorithm to account for that. The eBay price you see should more closely reflect what you'll actually pay. We'll continue to make refinements and try to make the site more useful. If you have any ideas for enhancements or changes that would make the site better for you, let us know in the comments below.